"One of my family's go-to recipes for using leftover Christmas ham. Enjoy with crusty French bread." Stir chicken broth, water, carrots, celery, onion, lentils, garlic, and red wine vinegar together in a large stockpot; bring to a boil, reduce heat to low, and cook at a simmer until the carrots are tender, about 10 minutes. 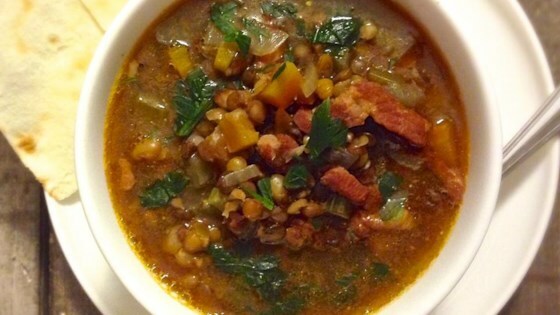 Stir ham, mustard, salt, and pepper into the soup; continue cooking until the lentils are tender, 20 to 30 minutes more. Just before serving, sprinkle some grated Parmesan cheese on top. For added smoky flavor, add 1 to 2 teaspoons paprika. OK per Lance. Doubled everything except onion and used 1 tbsp white wine vinegar and no water. Also used 4 cups ham. Excellent soup. I added one bay leaf because we like that flavor. I am certain that this soup would have been spectacular without it too. This was a good lentil soup. I added a package of chopped spinach for more veggies and sprinkled parmesan on top before serving.